With less than 1,700 miles back to the finish in Les Sables d'Olonne, 2nd placed Dutchman Mark Slats has sliced a further 393 miles out of Jean-Luc Van Den Heede's lead In terms of distance to finish over the past 8 days. At 08:00 UTC today, the gap was just 49 miles, Slats having gained 205 miles in the past 48 hours. Jean-Luc, whose Rustler 36 Matmut has led the Golden Globe Race since passing the Cape of Good Hope and at one stage held a 2,000 advantage, has seen his lead being whittled away ever since the 73-year-old Frenchman suffered a knock-down and sustained damage to his mast during a Southern Ocean storm in the South Pacific in November 1. Van Den Heede still holds a weather advantage and once passed the influence of the Azores high pressure system, should be first to benefit from the reaching winds that will give him an easier passage north towards the Bay of Biscay. But Slats is pushing hard despite a few problems of his own. In a satellite call to Race HQ on Monday, the Dutchman reported for the first time that he ran out of fresh water supplies a week ago, and is now using his emergency desalinator to turn salt water into fresh. It is hard work. An hour of pumping with both hands produces just 750ml of water - barely a cup full. The average daily intake is 2.5litres - 3 hours pumping! He also reported that during a period of calm three weeks ago he had dived on Ohpen Maverick's hull and completely cleaned the bottom of growth and slime. `'It was perfect" he said yesterday. So imagine his surprise when he dived again five days ago to find the hull infested with barnacles once more. "The biggest are 3.5cm long, but most are about 1.5cms. They are growing all over the hull." His first efforts to clean the bottom again were thwarted by the sudden appearance of a 3.5m shark, but he will use the next period of calm to have another go. "So far, this must have cost me about 50 miles." Third placed Estonian skipper Uku Randmaa whose Rustler 36 One and All, has also been beset by barnacle growth since crossing the Indian Ocean, is today caught in calms in the South Atlantic, some 3,000 miles behind the leading duo. He dived yesterday, and reported: "I'm swimming with dophins." We hope he recognises the difference between these mammals and their more agressive distant cousins! 800 miles to the South, American/Hungarian Istvan Kopar is making great progress northwards in his Tradewind 35 Puffin, seemingly having overcome his self-steering problems. 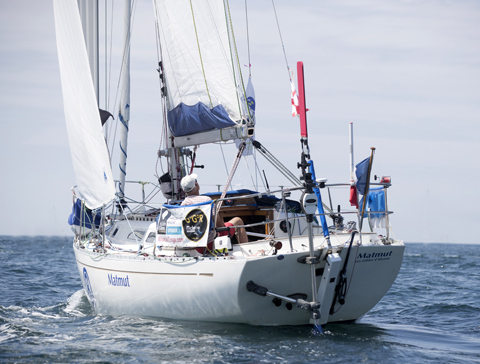 As is Finland's Tapio Lehtinen aboard his Gaia 36 Asteria who avoided the worst of one storm last week and is attempting to outrun another today. Now within 1,700 miles of Cape Horn but still beset with barnacle growth, he was making 4.3 knots today. Behind him though is the sceptre of Sir Robin Knox-Johnston's Suhaili catching up in their virtual race round the world. Suhaili's relative position from 50 years ago was 512 miles behind a week ago. Today, the distance is nearer 280! Still beecalmed! Jean-Luc Van Den Heede made just 19 miles over the past 24 hours, but his position to windward of Slats still gives him the advantage. Back in December barnacle growth and rigging issues forced 6th placed Russian skipper Igor Zaretskiy to stop in Albany, Western Australia where a medical examination found a continuation of a heart condition, and he flew home to Moscow for further tests. Would this be the end of his challenge? 2022 GGR entrant Robin Davie returned to Falmouth on Saturday four days after he was posted overdue, and largely unaware of concerns for his safety. UK Coastguard had issued an All Ships Alert for his Rustler 36 C'EST La VIE after his brother reported him overdue, which he answered late Friday night. Explaining his delay, Robin said: "Faced with calms and very light head winds, I decided to take a long tack out into the Atlantic and back to test the boat in these conditions. We know that this race is won and lost, not in gale force winds, but when they are light so I used the time to test myself and the boat. Because these boats don't have autopilots and rely on wind-vanes to steer by, we followed the wind on a circuitous route that extended the distance from a 300 mile direct course to nearer 700 miles. I was well out of radio range, and it was not until I was 25 miles SW of the Scilly Isles that I first heard the alert." Finland's Tapio Lehtinen is in a race to outrun the latest southern ocean storm - and the sceptre of being overtaken by Robin ``knox-Johnston's Suhaili in a virtual race around the Globe. Sailors have been making use of the amateur Ham radio net for decades. Competitors in the Nedlloyd Spice Race from Jakarta to Rotterdam back in 1979 were surprised to find that King Hussain of Jordan was an avid amateur operator and regular participant on their net. National telecommunication authorities have often turned a deaf ear to unlicensed operators using made-up call signs while at sea. But this may be coming to an end following a warning from one National regulator to a GGR skipper. They warn: "You use an amateur callsign and are making connections with amateur radio operators. The call sign letters are not registered, and thus illegal. I ask you to stop. If you have a legal amateur callsign then I urge you to present it". Fair warning both to unregistered GGR skippers and to legitimate Ham radio operators communicating with them. In Britain, the Ham Radio net is controlled by OFCOM, which recently revoked more than 500 licences for non-compliance. This includes communicating with unregistered Ham radio operators. The maximum penalty is 6 months in prison, a £5,000 fine and loss of their licence. GGR skippers have been using this free communication system to gain weather forecasts and maintain contact with their teams, which is allowed under the Race Rules, It is the responsibility of each skipper to ensure that they abide by National and International regulations. Such transgressions may not affect the outcome of the Race unless broadcasts have included position reports of GGR yachts which are not allowed. Should that be proved, then skippers face an immediate 48 hour penalty for the first offence, followed by disqualification. RUBICON 3 and GGR partner up for two special adventure sailing transatlantic voyages. Are you up for a Celestial Adventure with the 2018 Golden Globe Rce? GGR has partnered with RUBICON3 to send two ex-Clipper 60 yachts across the Atlantic on an adventure sail training and Celestial Navigation training exercise. You can join them and return home as a qualified Celestial Navigator. The first boat is full and only a few spots remain on the second for an end of March crossing. GGR will follow the voyage and profile the crew on Facebook. Susie Goodall was an instructor with RUBICON3 when she first heard about the GGR and they sponsored her sextant. Can you do it? YES YOU CAN! and why not. Relative positions of Uku Randmaa, Istvan Kopar and Tapio Lehtinen at 08:00 UTC today.